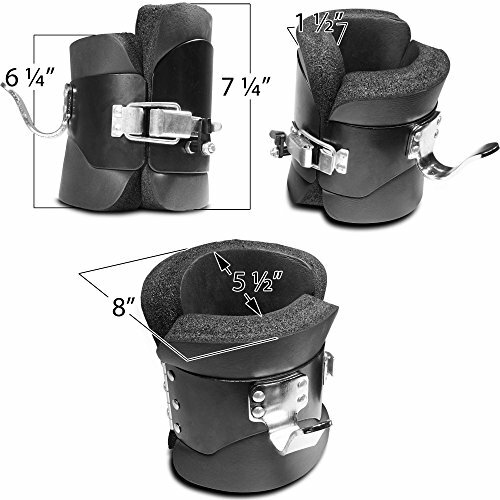 A quality pair of gravity boots works very similar to the ankle supports on inversion tables. The boots enable you to hang (feet over your head) and benefit from the inversion therapy. You can use these boots with inversion tables, racks or bars. Using all these equipment will enable you to enjoy the inversion therapy with more effectiveness and comfort. Now, there is a huge variety of gravity boots available on the market. Finding the right pair that meets all your needs and requirements is a very eschewing job. Therefore, we have developed this article for your assistance to enable you to find the right pair for your therapy sessions. We will recommend some of the best boots that offer value, convenience, and comfort. Therefore, we have developed a list of best gravity boots that money can buy. A small buying guide will also assist your decision making. This guide will enable you to look for some of the important features that you should consider when buying these types of shoes. After going through this guide, you will be able to make a value-based purchase decision. You can use an adapter kit that you can use with your Hang Ups by Teeter. This kit is compatible with different models of inversion tables including EP-560, EP-550, and other F-Series tables. 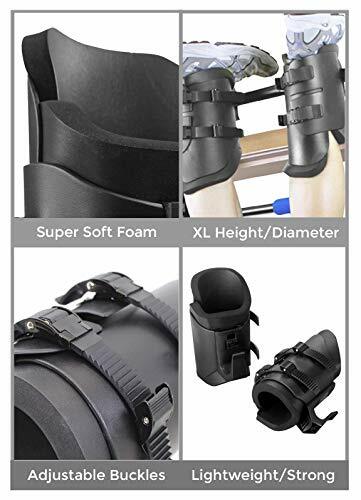 These boots can easily replace the standard clamps for ankles and can conveniently reduce the load on your joints of knees and ankles. The CV bar easily replaces the assembly of an inversion table. In addition to that, the DuPont Hytrel has the ability to lower pressure points. There are very soft foam liners present that are 5/8-inch in thickness and they can conveniently reduce compression. Furthermore, the gravity boots also boast ratcheting buckles that can self-lock. Each of these boots weight around two and a half pounds and also feature a calf loop that is fully removable. The lightweight construction of these boots makes sure that you don’t feel much weight once you put these on. The pair is covered under a warranty of five years. Moreover, these best gravity shoes boots are excellent for performing various other inverted exercises too. These include squats, sit-ups, and crunches. The Hang Ups by Teeter comes with an adapter kit that makes them compatible with different models of inversion tables. These include EP-560, EP550, and others from the F-Series from Teeter. These boots can conveniently replace the standard ankle braces and clamps. The boots can reduce the strain off the ankle and knee joints with ease. Teeter has used DuPont Hytrel in the construction to reduce the pressure points. Furthermore, the foam liners are 5/8-inch thick and offer tackle compression very well. The boots come with 5-year warranty. The gravity boots from Tonyko enable you to perform a variety of exercises. These boots also prevent you from various diseases that are caused by long time standing or sitting including cervical, lumbar spondylosis and different cardiovascular diseases. The hooks of these boots have solid stainless steel construction. While the pair also features easy-installing locks for additional safety. If you are looking for value then the EZ-Up XL by Teeter is the best product for you. Now you can go for sit-ups, crunches, and squats that are free of compression. You can conveniently use these boots for a warm-up before your exercise routine. The foam liners are 5/8-inch thick which eliminate pressure points. The Teeter designed gravity boots for inversion Teeter design tables such as EP-560, NXT-S, EP-550, X1, and EP- 860. You can use these racks and bars at the gym. The diameter of the maximum bar is 2.3 cm (1.25-inch). The best gravity boots come with a durable and secure platform, which is the best proposal before inversion by using equipment of non-Teeter. Generally, the outstanding inversion session helps to relieve the pressure from your sensitive parts such as ligaments and vertebrae disc. It assists to stimulate the blood circulation, minimizes the fatigue level, and improves the flexibility. You can also use it to perform inverted exercises such as sit-ups, crunches, and squats. The Teeter has presented the products with multiple benefits and designed for helping the customer to feel better, live better, and move better. This gravity inversion boot comes with a conversion bar, which is made by using DuPont Hytrel material that helps to minimize the pressure from your sensitive parts such as vertebrae disc and ligaments. Furthermore, the superior 5/8-inch soft foam assists you to reduce the level of compression and increases the comfort. It also presents calf loops for minimizing the load on top of the feet and knee joints. You can use by wrapping it behind legs for creating a small bend that gives a comfortable feel to the knees. These best gravity boots have the unique dual locking buckles, which protected the boots around the lower calf or ankles. These buckles have the most adjustable option that presents an option to customize it for a comfortable fit. It is specially designed to fit in almost all sizes of a calf or angle size. The company presents XL sized boot that has a 1-inch diameter as well as ½-inch taller. Moreover, the calf loops and hooks are formed of 40% nylon alloy or glass to make it durable and unmatched strength. The ankles locking-system is a most comfortable solution and provides flexibility for the inversion with this Teeter’s gravity boots. Each boot has 2.5 pounds weight that makes it easy to use. All of the above, the FDA registered this product as a medical device that is for muscle tension, Herniated disc, Sciatica, Back Pain, Facet Syndrome, Spinal Curvature, and Degenerative Disc Disease. The company presents you to enjoy 5-year warranty and assists you to release the pressure from the nerves, rejuvenate the disc, and discharge muscle tensions. The inversion boots are featured for presenting contoured support due to use of premium pads for feeling comfortable. It comes with safety levers, a locking mechanism that acts as a single-action, and the heavy-duty material made it more durable. Always make sure to tighten your boots around your ankles for a comfortable fit during the inversion training. Moreover, those customers who have thinner legs can also wear it for inversion. The 1-1 ½-inch standard diameter for standard chin-up bars provide extra padding for secure and comfortable fit with thin legs. It is designed by using high-quality material and present weight capacity as 150-KG. The one-sized designed gravity boots are most suitable for all people. The Tonyko presents the gravity boots with flexibility in affordable price that helps to reduce compression fatigue and other various diseases originate by standing and sitting more. 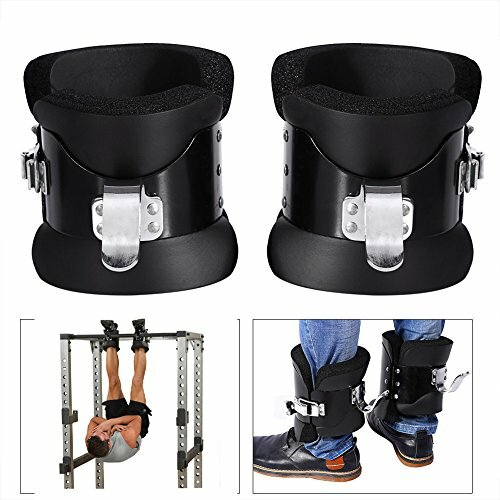 This is the ideal inversion gravity boot due to the usage of high-quality material and presented in low price. Additionally, it is best for the beginners who are taking inversion training due to comfort and ease of fitting. It is designed in only one standard size that is easily be fitted to everyone. Padding around the ankles provides a stability and comfortable experience that you needed for best inversion. Those customers who have a thinner leg, an extra padding is recommended to ensure safety and comfort. 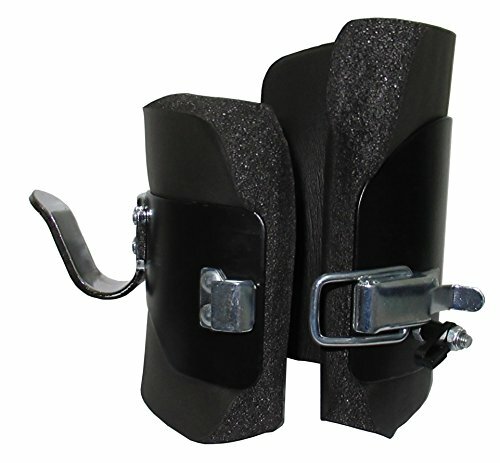 The sturdy and stainless steel buckles are used in gravity boots that provide more stability. The single-locking mechanism presents more safety lever to enjoy seamless and simple inversion for you. This high-quality product helps to release the pain and gives your muscles a relaxation feeling. All of the above, the doctors also recommend this product for relaxing your stressed and pressured muscles. The Tonyko gravity boots permit you to be recover from compression fatigue quickly that is the caused by aerobic training, bicycling, stepping, weight training, and jogging. The people who are suffering from back pain, spasms, muscles tightening, and disc dislocation, this is the ideal solution for it. It helps to reduce the neck, back, shoulder, stretched muscles, and compressed painful discs diseases. Enhancing the versatility helps to reduce the multiple pains with durability make it more popular. The use of stainless steel and padding components provide you with a more comfortable feeling during the inversion training. We recommend you to check out our Top Best Back Massagers and Top Neck Massager for Car, if you want the best massage experience. Lightweight gravity boot for inversion. The inversion Teeter racks and bars are compatible with multiple inversion tables with the ankle-lock system and t-pin convertible style. The models included in the inversion table are EP-860, NXT-S, and EP-560 models. The FDA registered this Teeter decompression device and point to sciatica, back pain, muscle tension, and much more. The diameter of the maximum bar is 3.2 Cm and approximately 1.25-inch. It presents a durable and secure platform for performing the inversion. It helps to remove the uncomfortable load or pressure from the knees and feet. 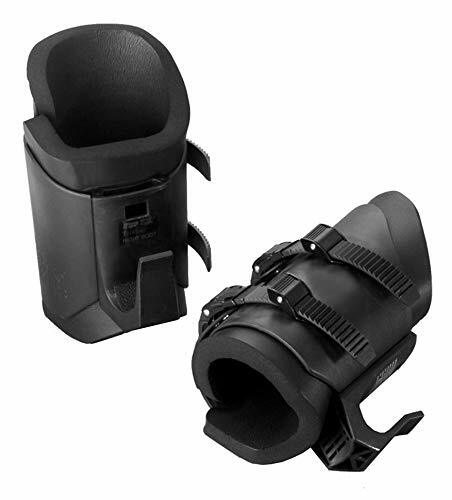 The EZ-UP XL Teeter boots are designed better and stronger as well as offers you additional security. It gives an excellent calf support with taller shell and longer straps. These boots are ideal for those people who like to do sophisticated gravity workout for relaxing their muscles. It is foamed by using high-quality material that makes it more comfortable and safer by providing additional enhanced features. Furthermore, if you want the gravity workout that release pressure from your joints then there is not any need to join the gym. 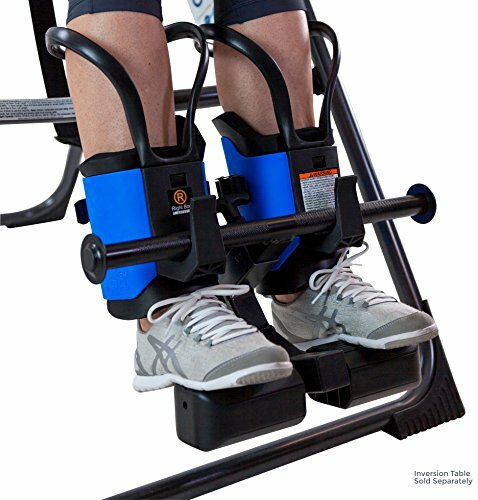 By using this Teeter gravity boot, you can enjoy the workout with any other additional equipment at home for better results. The use of outstanding soft foam provides extra support and comfort simultaneously. The EZ-Up XL boot of Teeter can easily differentiate from the standard EZ-UP gravity boot of Teeter due to colors. The EZ-Up XL is accessible in only one color that is black whereas the EZ-Up are available in blue color. This EZ-Up XL enhances the model of Teeter gravity boots due to its durability and portability. All of above, the decompression device of Teeter are registered by FDA that is indicated for muscle tension, sciatica, back pain, herniated disc, and much more. This plastic made boots increases the strength of your core and legs. You can do multiple exercises for relaxing your muscles such as sit-ups with compression-free, inverted squats, and crunches. This teeter gravity boots can be used as both pre-workout and post-workout. You can use the boots in pre-workout for warm-up muscles and for stretch and decompress it in post-workout. The soft 5/8-inch thick foam is used that helps to distribute the weight evenly for removing the pressures from the feet. Ideal to reduce the neck stretch, relax the shoulder muscles, and back pain. Some people are suffering from different kind of fatigues such as spasms and feeling more compressed muscles. Muscles are compressed due to multiple reasons such as high impact and hard workouts like weight training, jogging, and cycling. It is the best product to get relieved from shoulder, neck and back stretches and other related issues. Moreover, the weight capacity of this Titan Fitness boot is 3000 lb and accessible in black color. It comes with 07 ¼-inch long and 01 ¼-inch thick padding. The inside and outside diameter distinguished it from other products such as the inside diameter is about 03 7/8-inch and outside diameter is about 06 ½-inch. The Titan Fitness gravity boots are the ideal tool to attain your goal and offers a superior alternative workout in your home. This gravity boot helps to release the pressure from your sensitive parts of the body such as joins, bones, and backbone pain. You can enjoy an inversion therapy from 30-seconds to 2-minutes. Furthermore, the stainless steel buckles fitted around your ankles for the contouring purpose. An extra padding also helps to provide a secure fitting to those people who have thinner legs. It is recommended to use it after consulting doctor, when you are suffering from continual back pain. Make sure you have a clock while using this boot to follow a suitable time limit. If you are facing these and other issues associated with back pain or compressed muscles, you can probably relive from these issues with this hang-up boots. Hanging upside down grants you plenty of advantages such as reduce back pain, compressed spinal, and stretching muscles. The padding also provides you with more safety. Generally, the foam is used in its construction that comes with steel buckles providing more comfort. The weight of this inversion boot is 2.7-KG that makes it more popular and the weight capacity is about 225 lb. The Yosoo gravity boot offers more comfort and stability to the customers. The Yosoo hang up boots provide you support with extra padding and contour your ankle and feet. It offers more safety and stability due to foam material and steel buckles. You can recover from the stiff neck, back pain, and shoulder stretch muscle with contoured pads. Nevertheless, you can perform many compression relief exercises by wearing this anti-gravity boots. Keep one thing in your mind, tighten the boot hook for ankles comfort, and if you are suffering from back pain then consult your doctor first. The hanging upside down with this anti-gravity boot develops the pose and it is easy to put off and on. You can recover in form of muscles compression due to jogging, cycling, and another related exercise. Safety is your primary concern because you don’t want to fall off from the table during your routine. Therefore, you need to have a close look at the buckles and ensure that they come with a proper locking system. Another thing that you should take seriously is the material used in the construction. If you don’t feel comfortable while wearing your gravity boots then inversion therapy will not become a regular part of your life. Therefore, make sure that you keep your comfort to the maximum while wearing these boots. Comfort and usability go hand in hand. If you are not comfortable wearing your shoes then you won’t find them very easy to use. Therefore, you must understand that buying a pair that offers excellent ease of use will bring more comfort to your life. Durability should be there in your gravity boots. Safety and durability go together and you don’t want your boots to break up after you have only spent a couple of weeks with them. Having a close look at the materials and stuff will enable you to determine the durability of your gravity boots. Make sure that you can wash your boots regularly too. Take specifications, measurements, and limits very seriously. Consider their weight, thickness, and weight capacity before you finalize your purchase decision. If you need a bar for installation then make sure that you have a proper place to install it too. In addition to that make sure that you focus on correct dimensions before finalizing your purchase decision. Even after having a close look at all the features, you might see that there are some issues that you couldn’t identify on the first place. This is because you didn’t consider adaptability of your pair. The pair must be able to adapt according to the needs and requirements of different users. Also look for any additional accessories. Another one of the biggest aspects of buying anything is the price. Don’t go for the most expensive options right from the beginning. Make sure to identify each and every feature that you are paying for. Don’t overspend on a pair made for an extreme workout if you only want to enjoy simple inversion therapy. Frankly speaking, attractiveness shouldn’t be in your checklist when you are looking for a pair of gravity boots. This is not the boot that you will wear down the street with your family and friends. You might end up showing them off in your gym but nothing more than that. To conclude, we would like to highlight again the top pick product and why we recommend it. The Hang Ups from Teeter are among the best gravity boots that money can buy. The pair boasts an adapter kit that enables you boots to remain compatible with different models of inversion tables including EP560, EP-550, and some F-Series models. 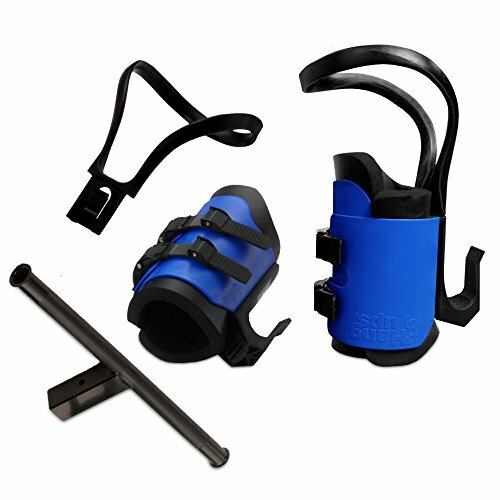 The boots can conveniently replace the standard clamps on your inversion table. Teeter has used DuPont Hytrel in the construction and the 5/8-inch thick foam liners lower pressure points. Each of the foot weighs approximately two and a half pounds which means that the pair very lightweight and you will not feel it much while wearing. Your purchase of these gravity boots is also covered under 5-year warranty. There are plenty of options available on the market when it comes to gravity boots. Make sure that you only buy a top quality product if you want to extract maximum benefit out of your investment. Do not overspend on boots that only offers looks and not much performance. We hope you have found this article very informative. If you have any suggestion or queries for us then leave a comment in the section below.